Margaret Hamilton was one of the forerunners of women in computer science (the actual work part, not just the what-shoes-to-wear part). 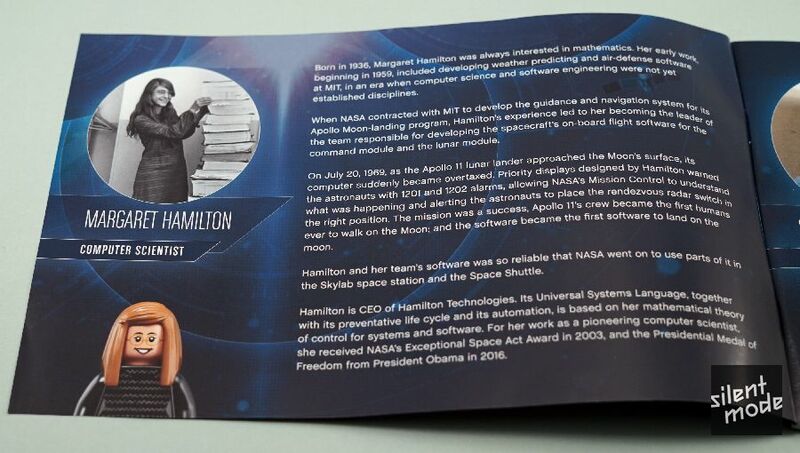 Her work was not only instrumental in the first moon landing, but also for the Space Shuttle and the Skylab space station. 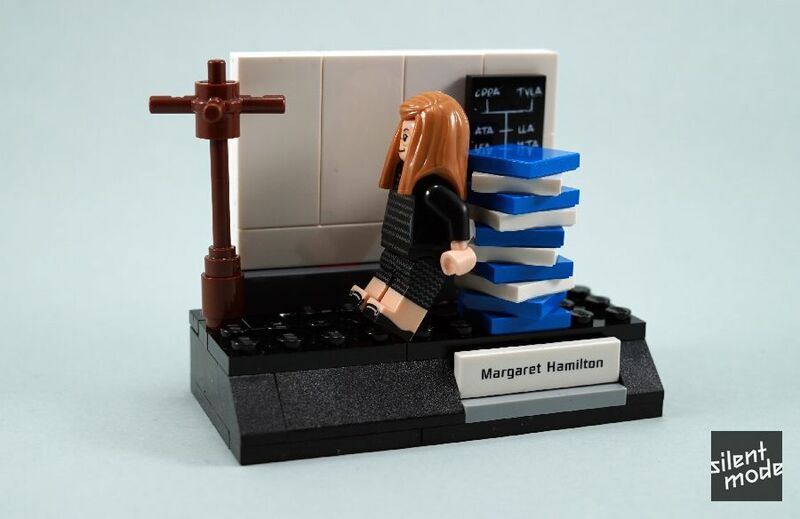 Of the four minifigures in this set, Margaret is the most distinctive and has been the most heavily featured – not least because of the publicity shot with the real Margaret Hamilton. She features the most detail, being the only figure with leg printing. The set has three vignettes or display stands in total, and they’re all constructed in a similar way. Your favourite/preferred fan sites have already done a breakdown of interesting parts, so I’m not going to go through them in this review. So we get to this part of the first build, and at first glance this board isn’t all that impressive. 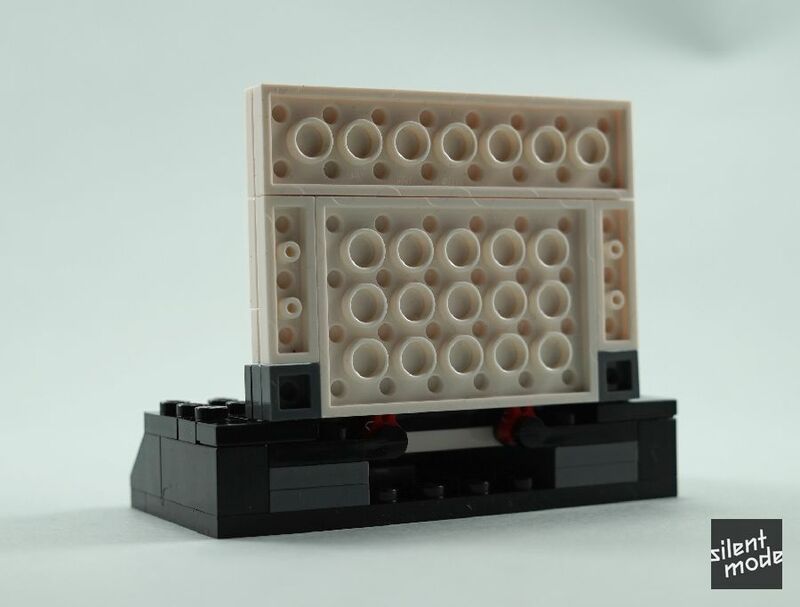 The arrangement of White plates that form the base aren’t particularly stable. Although I haven’t yet made any use for it, I’m dead pleased about the introduction of the 2×3 tile – something I’d actually suggested on Twitter for all to hear. However, it’s still in its early stages, so it’s not a very common part. What was particularly clever was how the board is attached to the base, which you can see above. I would never have thought of that specific technique. When you’re done admiring the clever building technique for the board (or wall! ), you get to build Margaret’s trademark stack of papers. The stack represents the code used to develop the software she became famous for. And here’s Margaret posing for the camera, staring at the coat hanger with nothing to hang on it.